Teething is a natural stage in all baby’s lives. It can start as early as three months of age or begin as late as 15 months. Often, the first teeth will erupt around six months, and by three years of age, your child will have all of their primary teeth. 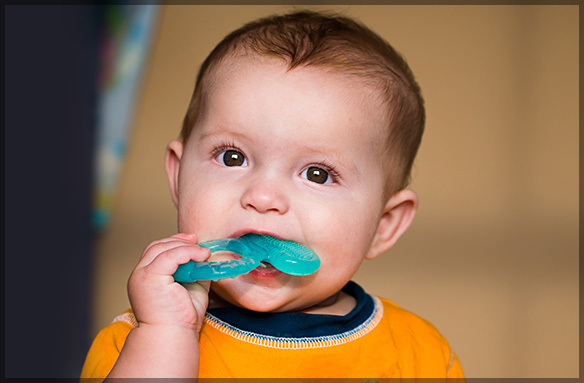 The teething process itself can be a particularly hard time both for yourself and your child. Here are our suggestions for what you should and should not do to help make the process easier. First, never give your baby something to chew on that can pose a choking risk. While amber necklaces have been popular as of late, there is no scientific evidence proving their pain-relieving properties, and should any bead come loose, they can be a choking hazard. Avoid liquid-filled teethers. Your baby can potentially puncture these, causing whatever they were filled with to leak out and be ingested. Don’t place any cold or object on the gums for too long, as you can harm this sensitive tissue. Also, do not freeze anything you plan to give to your baby for teething. While a fever during teething may occur occasionally, don’t ignore any temperature above 101°F, as this could indicate an infection or more serious concern. Consult with your pediatrician if your child is experiencing a high fever at any time, not just during teething. After washing your hands, you can place a finger in your child’s mouth and rub and massage the gums to help alleviate some of the pain. Be careful not to get bitten while you do this. If you prefer not to use your finger, a chilled spoon will also be effective. You may wish to put their pacifier or a teething ring in the refrigerator so that your baby has something cool to chew on, as the cold temperature will help with the discomfort as well. The same idea can be applied to a cool, damp washcloth. Make sure you monitor your baby with the cloth to ensure no strings or other potential choking hazards arise. Your baby may also drool more while they are teething, so it will be a good idea to keep a bib or dry cloth nearby to help clean up the excess saliva. If their skin is sensitive, putting a protective cream on their cheeks and chin is recommended as well to help protect them from any potential drool rash or irritation. If the pain gets to the point that your child is having issues sleeping or seems particularly uncomfortable, consult your pediatrician for advice. They can suggest which pain reliever and dosage is recommended to help reduce the discomfort and inflammation, allowing your baby to relax and have a restful sleep. It’s important to schedule your baby’s first dental visit by age one. This allows us to perform a quick checkup and teach you how to clean and care for your baby’s teeth properly. Give Family Dental Care a call at 613-736-5000 to schedule an appointment today. 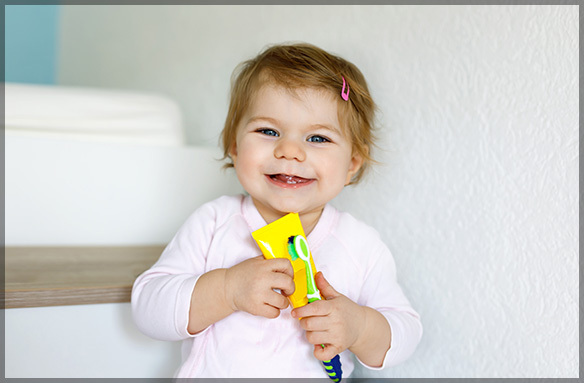 We look forward to meeting your little one and setting them up for a lifetime of good oral health!